What the New Orleans Saints will want to avoid like the plague is an 0-2 for the third year in a row. They’ll try to break the curse when they take on the New York Giants at MetLife Stadium in New York on Sunday. Just like their challenging game last week against the Oakland Raiders, this week’s rival will present a lot of challenges for the Saints team, especially when their prime cornerback Delvin Breaux who has a fibula injury, will be out on Sunday afternoon. For the Saints to win on the road, there are several key matchups they will have to win. And this upcoming game, has been the hottest news topic of the week in New Orleans since everyone knows where an 0-2 start will take you. 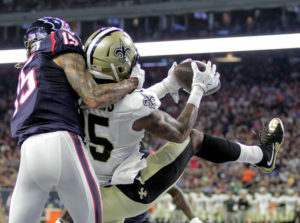 With Breaux out, the Saints will now have to rely on an inexperienced group of cornerbacks to limit opposing receivers. It’s going to be very difficult, but the young cornerbacks have to prove they’re not overmatched against a Giants team who have a top receiver trio of Odell Beckham Jr., Victor Cruz and rookie Sterling Shepard. Up against them, they’ll have to play above their level. P.J. Williams will have to be positioned on the outside, and De’Vante Harris will have to be in the slot. Strangely enough, both players will be making their second career appearance. Then at the other outside spot, the Saints should turn to veteran Sterling Moore due his experience covering Beckham. Or they might go with Ken Crawley, who is an undrafted rookie like Harris. He also struggled greatly in Week 1 so Moore might be the better pick in Sunday’s game. No matter who plays though, the Saints cornerbacks will have to work super hard to prevent big plays. The Giants receivers will be open at times of course, but if the Saints can avoid gains of 20-plus yards, they’ll be able to limit New York’s offense and get on the board themselves. The Saints know that covering the angles will be key to limiting Giants star Beckham Jr. Since, Beckham had three touchdowns against the Saints last year. So they will watch out for him closely. Olivier Vernon is the Giants $85 million man, who they signed with hopes of having the dominant pass rush they used to rely on so heavily in past years. He didn’t rack up a sack in Week 1, and the Saints will try to get away from him on Sunday, preventing him his first this season. The Saints Zach Strief will be the go to man to be responsible for blocking Vernon on Sunday. And when you look at how well Strief played against Raiders star Khalil Mack in Week 1, then this is a matchup the Saints could win. They might also use tight ends or running backs to chip away at Vernon during the game. The Saints had zero sacks in Week 1. And everyone knows without sacks or turnovers, it’s tough to win games. It will all rely on the defense. Another advantage the Saints could have on Sunday is Cameron Jordan against Giants right tackle Marshall Newhouse. Jordan didn’t do much in Week 1, so he’ll definitely want to make his presence felt in this game. On the other side, Paul Kruger could have some good looks against left tackle Ereck Flowers, especially with Kruger being a savvy veteran and Flowers is only in his second year. But, whether it’s Jordan, Kruger or the backups, the Saints desperately need to pressure quarterback Eli Manning to help the young cornerbacks and get a few turnovers to go their way. If Manning is on his game though, that will be tough to accomplish on the road.